The Bungle Bungles National Park is such a beautiful place, it would be a shame to try and rush through in only one day. 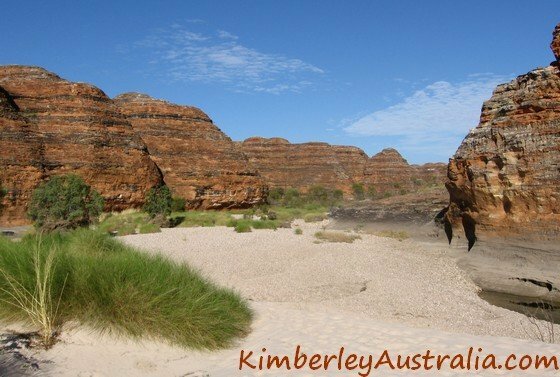 But if your time in the Kimberley is limited and that's all you have to spare for Purnululu National Park then I want to make sure that you get the most out of it. 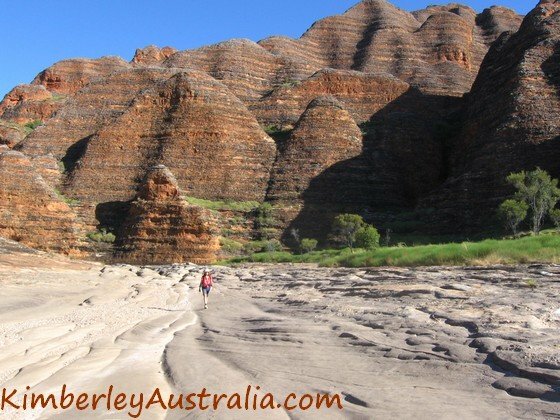 The Bungle Bungles National Park can be divided into two sections: a northern and a southern part. Each area features several walks and a campground. You will get your first impression of them as you drive towards the range. 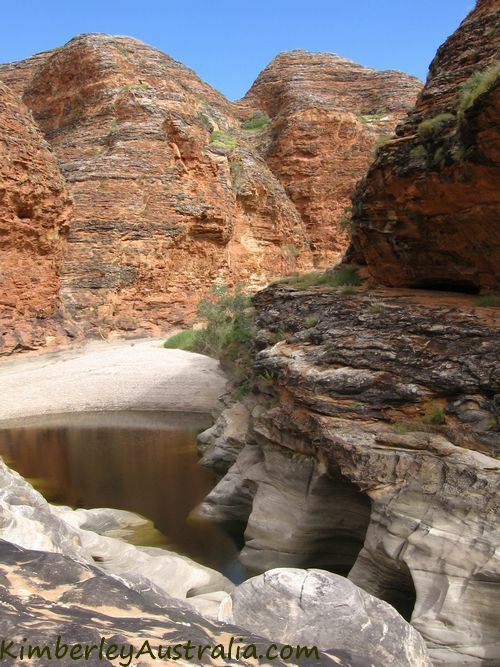 I'll start with the most famous of all the Bungle Bungles walks, which is also one of the easiest: the walk to Cathedral Gorge. Like all other walks in the southern part it starts at Piccaninny Creek car park. Piccaninny Creek car park. © Photo by reader Jean-Daniel. You should allow at least one hour so you can spend some time marvelling and absorbing the atmosphere. Cathedaral Gorge is impossible to capture in a photo. 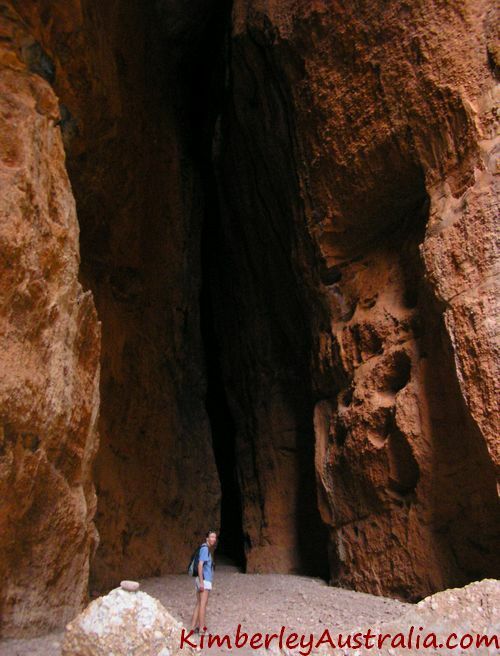 Cathedral Gorge is a huge natural amphitheatre. The rock ledges on the left invite you to sit down, and watch, and observe. The acoustics are fascinating (when there aren't too many people around). The voices are carried around and if you turn your head in the right direction the people on the opposite side sound as if they were right behind you. ...and if you look up you will see shrubs dangling from the towering walls. Just sit there and reflect on the time, the amount of water and the forces it took to form this place. © Photo by reader Jean-Daniel. It only takes about 20 minutes, so why not? 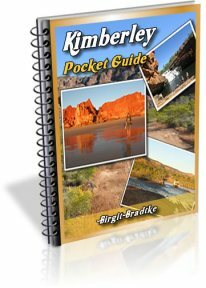 Piccaninny Creek Walk is often misrepresented in information materials about the Bungle Bungles. It often says that it is an overnight hike. As a result only very few people even think about it. 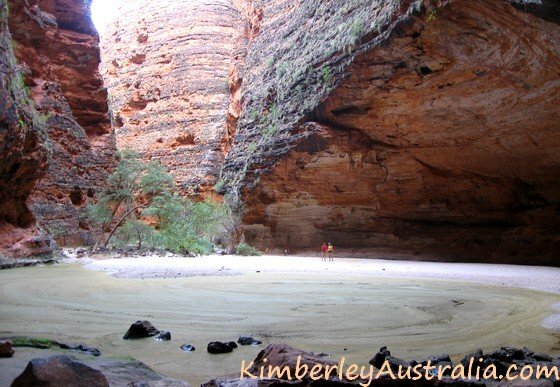 But you don't need to stay inside Piccaninny Gorge over night! Just walk as far as you are happy to, and then turn around. Easy! 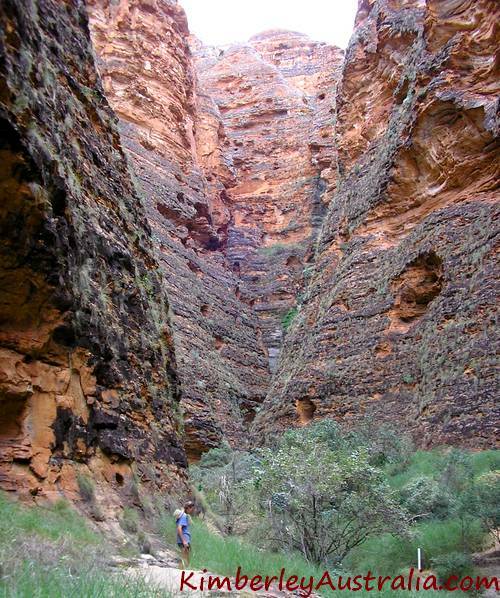 This is by far the most beautiful and most rewarding walk in Purnululu. You follow the eroded creek bed, sometimes stepping from rock slab to rock slab and sometimes working your way through deep, loose gravel. 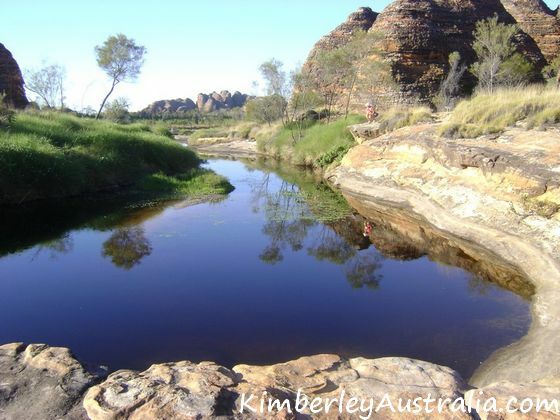 If you have the time to spend a full day you can walk as far as Black Rock Pool, a big deep waterhole, nearly fully surrounded by towering black cliffs. It's the most reliable water source on the way (boil or treat it before drinking), it's always shady and the water is freezing! Not far from the start of the Piccaninny Creek Walk is a turn off to the right which takes you to a lookout. Even if you really don't have the time to walk along Piccaninny Creek, maybe you can make time for the lookout? It takes about half an hour to 45 minutes to get there. Uh-oh. A little too late for the sunset. Another 20 minutes further along into Piccaninny Creek the Whip Snake Gorge branches off. 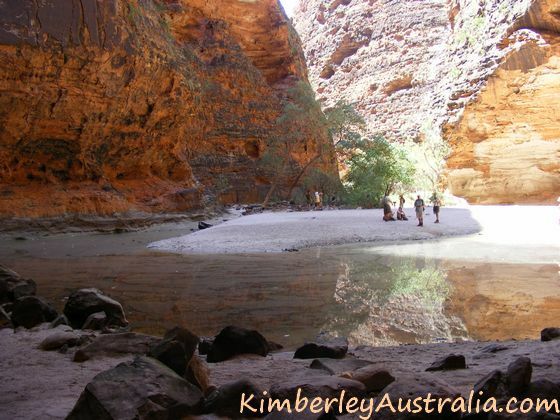 The gorge is narrow and at the right time of the day cool and shady which is often welcome after the baking heat in the open creek bed. The walk ends at high rock walls, a little like a smaller Cathedral Gorge. On its own this is a 10 km return walk from the car park, which makes it about a half day walk and great end point if you do not plan to spend all day or even overnight in Piccaninny. 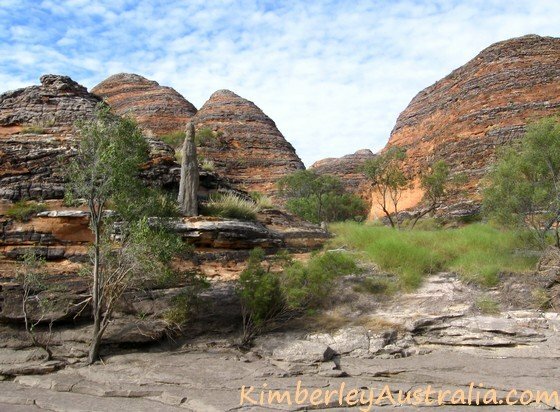 This part of the Bungles looks very different and you don't find the famous domes here. 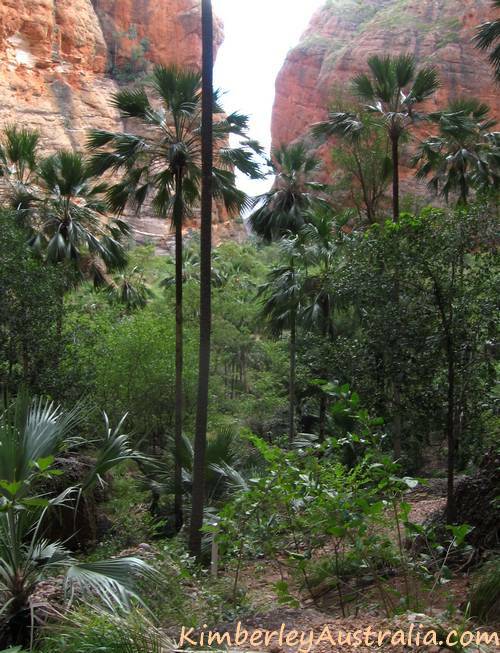 The Froghole and Mini Palms site has been renamed into Bloodwood, but the walk into the gorge is still called Mini Palms. Go figure. This 2 hr/5 km return hike takes you over loose rocks in a riverbed into a narrow, boulder strewn gorge filled with Livistona Palms. The further you go the steeper the track becomes. It's a fun walk and not too hard because there are stairs for the steepest parts. 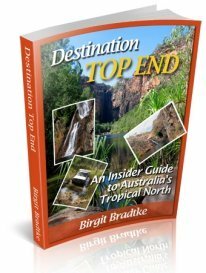 You eventually reach a viewing platform overlooking a palm filled valley surrounded by 150m high cliffs. 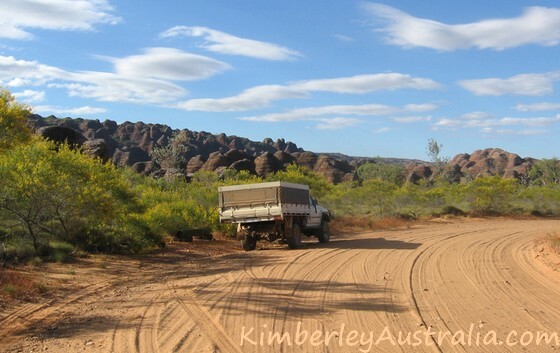 This is a newer trail that was established to take pressure of the other locations around Purnululu. 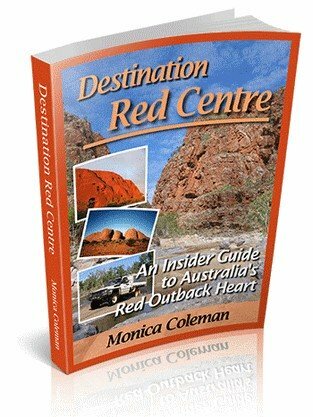 It also starts from near Bloodwood. The 4.4 km return walk through the Homestead Valley offers nice views over the escarpment. 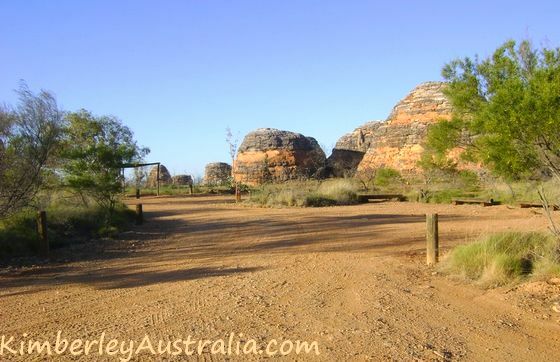 The end point is a hill surrounded by greenery backed by towering red rock walls, a bit like a massive amphitheatre. Impressive views for sure! This one is fun, too. And easier and shorter then Mini Palms (1 hr/2 km return). 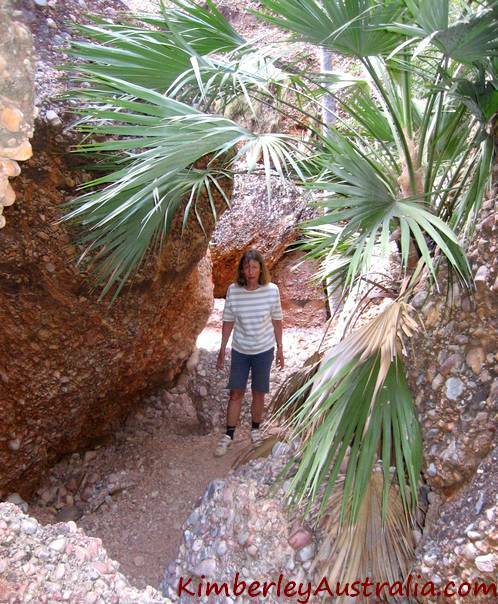 Initially you walk through a palm filled gorge, but that soon becomes narrower and narrower, and then narrower still. Every now and then you have to climb over boulders blocking the way, or duck under some that didn't quite make it to the floor and are stuck above you, where you hope they'll stay until you're gone. 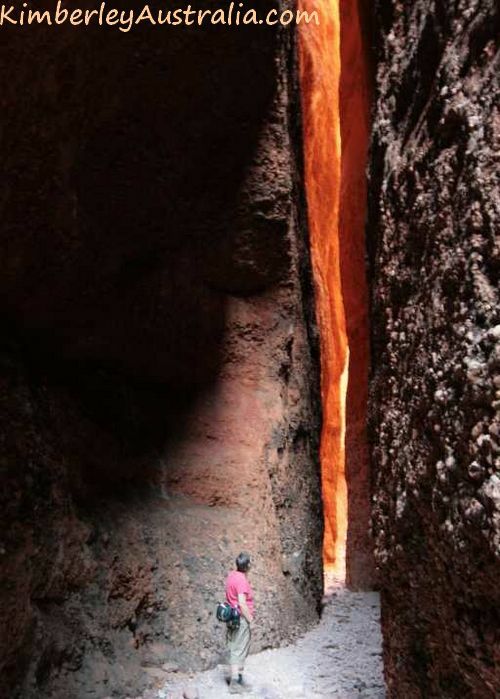 In the end you find yourself in a gap that's less than a metre wide, with walls so tall that it's nearly completely dark at the bottom. Unless you can schedule this walk around midday. Then you will see the walls above you glow in striking colours, changing with the angle of the sun. Another more recently established walk, this one opened in 2013/14. 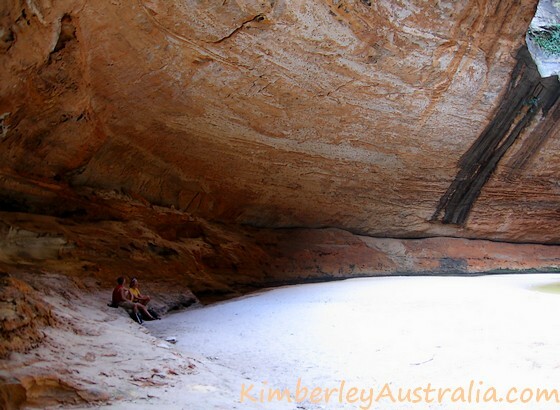 Also starting from Echidna Chasm car park you follow the bottom of the escarpment. After 2.6 km you get to the Mini Palms turn off and 1 km further, after 3.6 km all up, to Bloodwoods. 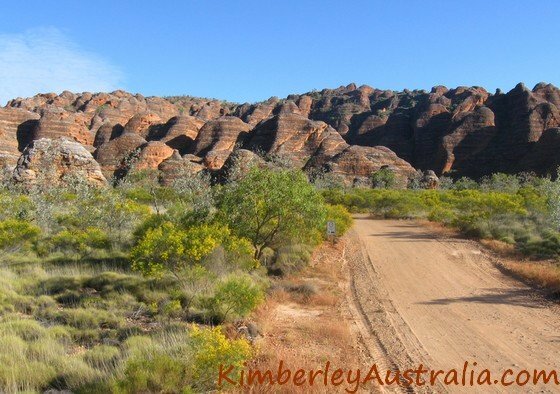 It is an easy walk, no rocks or boulders, no uphill, just bird life, plant life and the impressive backdrop of the northern escarpment towering over you. 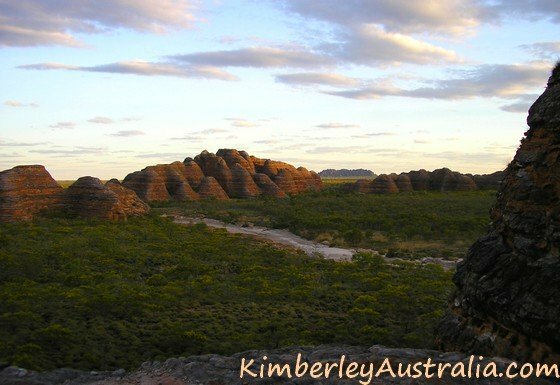 The northern part of the Bungle Bungles has its own sunset lookout, too. The Walanginjdji Sunset Lookout is close to the Visitor Centre. A few minutes of walking will take you to an area with several seats, so you can enjoy wine and cheese while you watch the western escarpment catch fire. 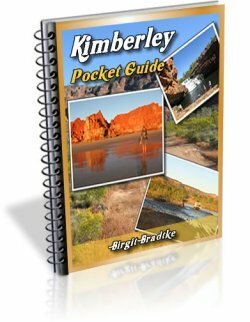 Read about other Kimberley National Parks.